Can't attend? Follow Fat Fish to know of future events! 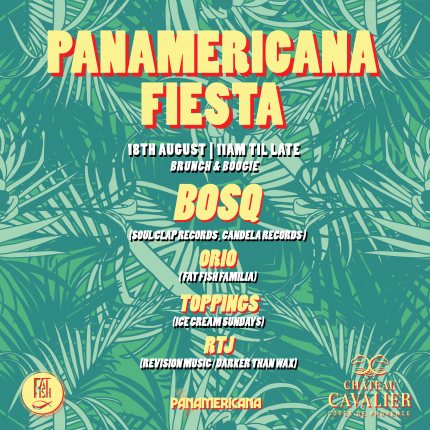 Dust off your Cubans, dig out your sombreros and samba down to the first of a kind "PANAMERICANA FIESTA "
Delicious brunch menu, Fresh dj's at absolute gorgeous venue. The rich Panamericana experience is an extensive range of wines from Canada to California, Chile and Argentina; North and South American draught and bottled beers; spirits, including bourbon, tequila, raicillia and pisco; and crafted signature cocktails inspired by the region and well-loved classics such as Old Fashioned, Manhattan, Whisky Sour, Margarita, Daiquiri, Mojito, Gin Fizz and Sazerac. Tickets & Seats are LIMITED! Bosq, has been tirelessly exploring the intersections of Afro-Latin music with Disco, Funk, Reggae, House and Hip Hop for years. Since the release of his first album of entirely original music, bosq y orquesta de madera (2013, Ubiquity Records) he has only increased the pace. The result is 2 more full length albums on Ubiquity: Celestial Strut (2015) and Love & Resistance (2018), a full length album recorded entirely in Puerto Rico Bosq y La Candela All-Stars - San Jose 51 (2016, Candela Records) and an EP for Soul Clap Records entitled Tumblalá (2015). Bosq’s music has seen consistent play from the likes of Gilles Peterson & Craig Chariles on the BBC, KCRW, RinseFM & countless others, while Dj’s like Poolside, Nancy Whang, Soul Clap, Laurent Garnier & Jeremy Soul give his tunes constant rotation in clubs and at festivals. Gigs have taken Bosq across North & South America & Europe, sharing stages with Joe Claussel, Bobbito, Quantic, J Rocc & Tony Touch to name a few. And now we have him for the first time in Asia! Originally from Israel, Orio's desire to share music and love with the world, his contagious charisma and magnetic energy sets a pace that is both exciting and relatable to many. His ability to create an easy, raw and authentic vibe with the crowd is all a part of his magic. He is the founder and Artistic Director of Fat Fish Familia, and is the resident of Kilo Lounge & Tanjong Beach Club Tiki disco line in Singapore. Hailing from Manila, Toppings (aka Jake Camacho) has emerged as a fresh new face in the Singapore dance music scene. As co-founder and resident selector of Singapore-based party collective Ice Cream Sundays, he has honed his craft playing to sweaty crowds at pop-up events around the city. He has also taken his sound to venues such as Tanjong Beach Club, Bar Canary, Lantern, and Bar Rouge, and is a familiar face behind the decks at underground favorite, Headquarters. With a background in music history, and having played a number of instruments from a young age, his exposure to diverse musical styles and traditions shines through in his eclectic approach to DJing. Rooted in deep, soulful, and lo-fi house infused with disco, funk, jazz and afrobeat, each of his sets delivers a potent blend of dance floor nostalgia, playful experimentation, and — at times — pure, uncut optimism. Having cut his teeth at house parties and jam sessions, RTJ is a vinyl collector and selector who is fast making his presence felt in the local music landscape of Singapore. A core member of Revision Music, and loosely affiliated with Darker Than Wax, RTJ’s growing oeuvre of eclecticism spanning across genres of rare groove, funk, jazz, boogie & anything soulful, has captivated the pre-game audience looking to listen, learn and be enlightened.